Ultimate Blood™ Base Product Information | Smooth-On, Inc. Basic red blood for the Ultimate Blood™ system. Use with Ultimate Blood™ colors, Thinner and Thixo to create a world of blood effects. The most realistic and versatile liquid blood system available anywhere. It perfectly simulates human blood in how it looks and flows. 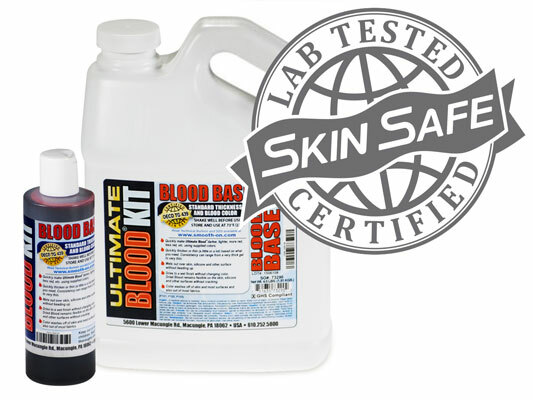 Ultimate Blood™ is ideal for creating special effects, medical training and simulation, moulage or any project in need of highest quality theatrical blood. Ultimate Blood™ was tested and passed for skin sensitivity per OECD Test Guideline 439. This test was developed to determine skin sensitivity of materials. Note: Ultimate Blood™ is not suitable for “in the mouth” use.